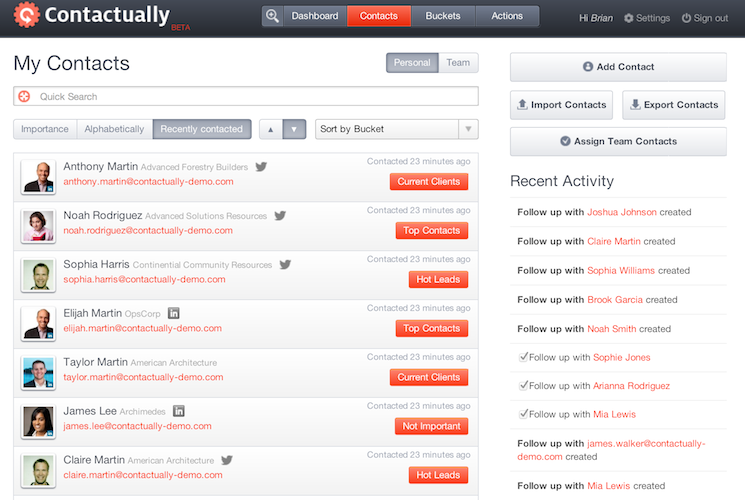 Contactually focuses on managing your most important relationships. CRMs are incredibly useful tools that, when utilized properly, can be a tremendous asset to an individual, a team, or a company. The problem is, CRMs don't properly reflect with how we work. We interact with them through clunky web applications, and endless forms. You have to remember to feed your CRM more data, otherwise it's rendered useless. Contactually hooks directly into your email accounts (no browser plugins or software to install) and automatically reminds you when you should contact someone based on rules you have defined. 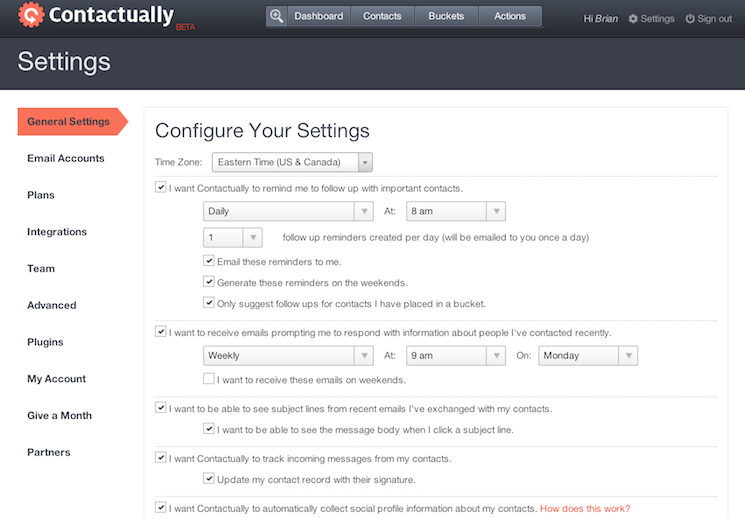 Contactually is a personal assistant for your important contacts. We connect your email and social media accounts to our system, analyse your history with each relationship, and automatically prompt you (via a daily email reminder) to re-engage with important people that are slipping off your radar. We can also sync all that aggregated contact info with other systems, like CRMs and campaign management software. See who you keep in touch with each week. 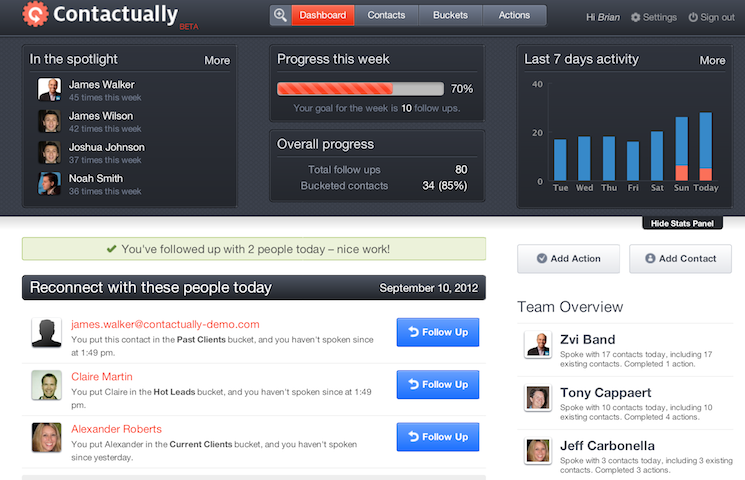 Track your overall follow-up progress, reconnect with your most important contacts, manage your action items, and view your team’s productivity all from the Contactually dashboard. 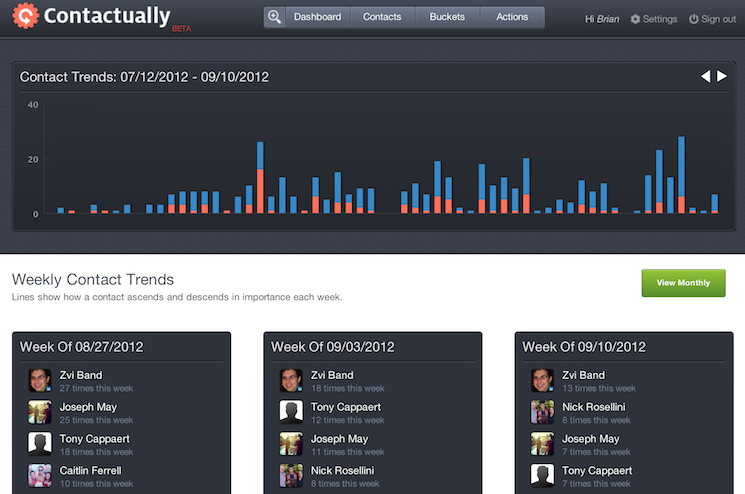 With additional insights into your communications patterns, you can see how your trends have changed from week to week. Your Contactually address book aggregates and syncs contact data from your email, social network profiles, and customer relationship management tools, ensuring that you always have the most up-to-date contact information. 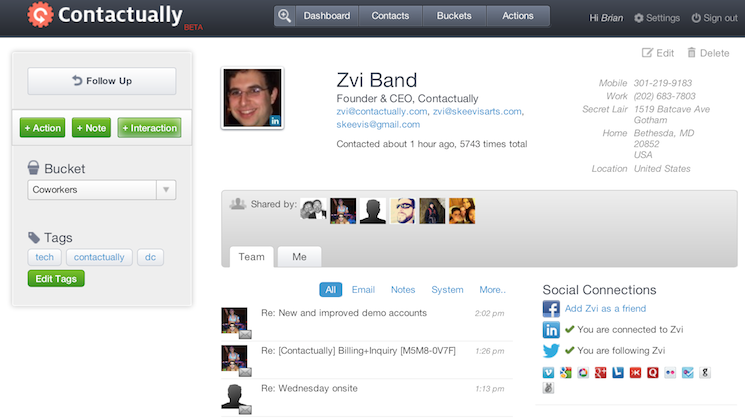 Each of your contacts has a Contactually profile. You and your team can view that contact’s conversation history, record important contact information, link to social network profiles, and add notes, action items and recurring events. 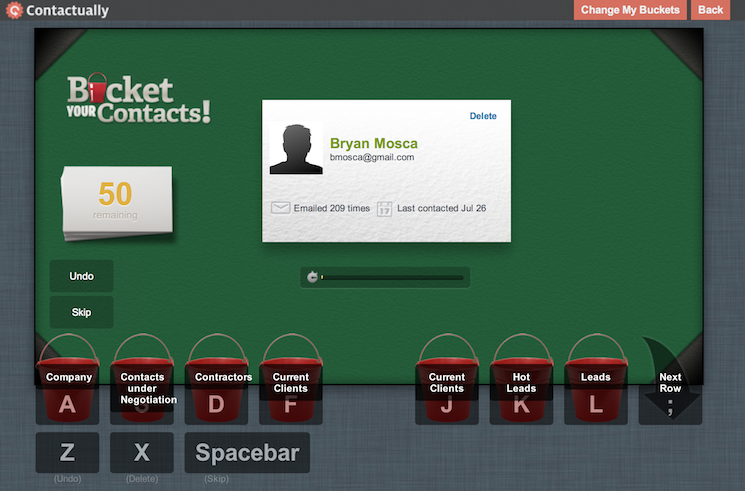 Simply drag and drop your recent and top contacts into buckets for easy organization. 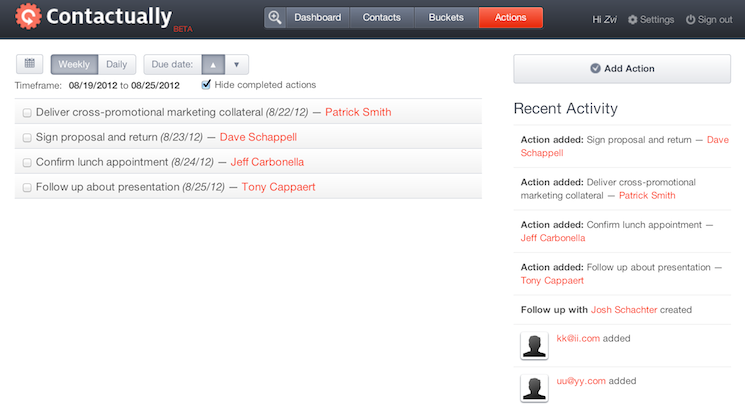 Select which buckets of contacts you would like to share and sync with your team members. You can also connect buckets to CRM and campaign management programs such as Salesforce, SugarCRM, Pipedrive and MailChimp. 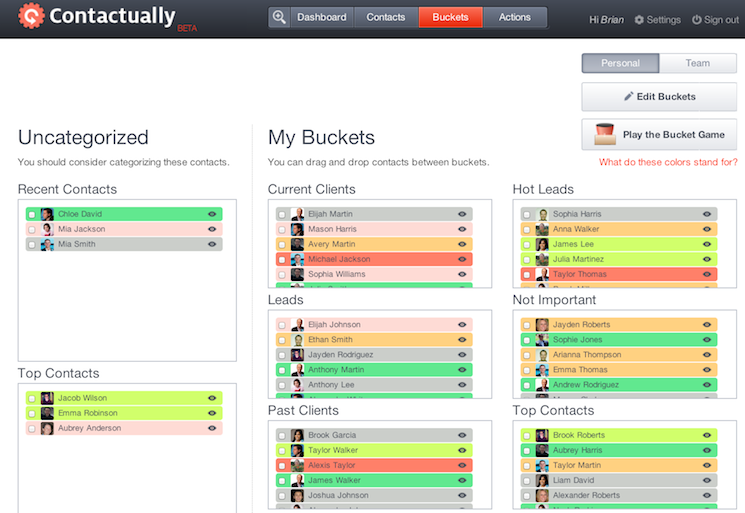 Play the Bucket Game to quickly sort 50 contacts at a time into their appropriate bucket. Productivity has never been so fun! Add action items associated with your contacts to your to-do list and schedule their due dates. Assign them to yourself, or to your team members. With Contactually’s Chrome plug-in for Gmail, you can receive follow-up recommendations right in your inbox and bucket your contacts directly from the compose window. Choose how often you want follow-up reminders, whether or not you’d like to see subject lines in your conversation history, whether or not you’d like Contactually to scrape email signatures for updated contact information, and more.